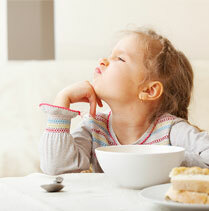 | Healthy Living Articles | Food and Meals | How Much Fiber Does My Child Need? Fiber is found in many different foods that can add color and good nutrients to your family’s meals, and help prevent chronic diseases! 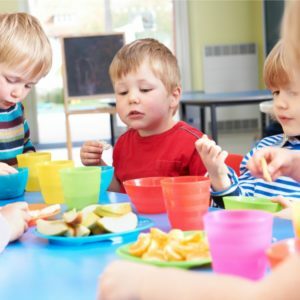 Even though fiber is in many whole foods such as fruits, vegetables, and grains, the average dietary fiber intake among children is much lower than the recommendations. For children ages 3 to 5 years of age, the average fiber intake is about 11 grams per day. 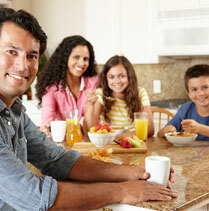 For children 6 to 11 years the average fiber intake is about 13 grams per day. That is 50% less than what they need! Making sure your kids eat a variety of plant foods like fruit, vegetables and whole grains each day can help prevent poor fiber intake. So how do you know how much fiber your child needs? It depends on their age. Typically, for children under 2 years, there is no recommendation for total fiber. Just make sure to provide a variety of fruits, vegetables, beans and whole grains as you introduce solid foods. Once adolescents reach twenty years of age, the recommendation is 25-35 grams per day (or about 10-13 grams per 1000 calories) as for all adults. See 20 fun ways to boost fiber intake. And finally, make sure to introduce fiber slowly and drink plenty of water to prevent any undesirable side effects. Your child’s body will get used to the extra fiber over time. Read 6 Ways to Boost Fiber to get more ideas!